By default, iTunes or iCloud will sync your contacts in bulk, with little control over the process, and no export options. With iMazing, it becomes easy to transfer contacts from your iPhone to your computer, or the other way around – sharing contacts securely, without syncing, and outside of the cloud can be done in just a few clicks. vCard – standard format for electronic business card. CSV – format compatible with Excel, Numbers, or Sheets. 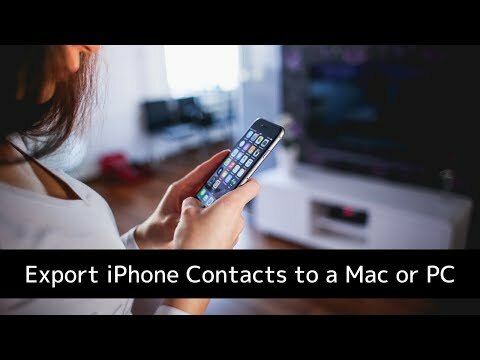 Anyone who wants to transfer or backup their contacts to their computer, or to an external drive. If this is your first time connecting your device, iMazing will initiate a backup to pull your contacts. Select the contact(s) you want to export. In the bottom toolbar, click one of the Export buttons. This will open a save panel dialog box. In the dialog box, select where you want to export your files, and click Choose. Click Export to VCard. This will open a save panel dialog box. Double click the exported VCard file to open it in Mac Contacts app. Click Export to CSV. This will open a save panel dialog box. Choose a target location for the CSV file and confirm. Launch the spreadsheet program of your choice, and import the CSV. On the Mac, .csv files can be directly opened in Numbers. Importing to Google Sheets is done via the File->Import menu. Importing to Excel may require a bit more work, especially if you are using older versions of Excel. This guide on importing CSVs in Excel should help. change the Data Export delimiter for .csv exports to Comma, Tab, or Semicolon. adjust vCard export settings for exporting multiple contacts: output multiple vCard files containing one contact each, or a single aggregated vCard. ⚠ Outlook and Windows Contacts can only import vCard files containing a single contact. Exporting contacts to Outlook is achieved by exporting to CSV first, and importing the CSV file to Outlook.